An interesting tidbit about Chondrosarcoma, was that it tended not to occur in the long bones of adults possibly due to the shortened telomeres of mesenchymal stem cells there. If we were to know that Osteosarcoma was possible to occur in the femur and tibia and other long bones than it is likely that telomere length is a likely limiting factor to increasing height after puberty. It could be the reason why some individuals have reported growing taller from the GHenerate and IGH-1 combo due to the content of IGH-1(putting aside the lack of photographic evidence of this height increase for a moment). Short telomeres inhibit stem cells from differentiating to chondrocytes so if you are older in age and are not growing taller with Lateral Synovial Joint Loading then consider supplementing with Astragalus Membranaceous. (Astragalus Membranaceous ) What can Osteosarcoma tell us about height growth? Epidemiological data for common bone sarcomas. "At the largest center for histopathology in Pakistan, we looked at three common bone sarcomas in our practice i.e. osteosarcoma, Ewing's sarcoma and chondrosarcoma. An overwhelming majority of osteosarcomas in our study occurred in the second and third decades of life; they were common in males; and femur, tibia and hip bone were the commonest bones involved accounting for an overwhelming majority of cases. The large majority of Ewing's Sarcomas in our study occurred in the first three decades of life; they were more common in males; vertebrae, tibia, femur and hip bone were the commonest sites. In our study, chondrosarcomas showed a wide range of age distribution and occurred quite commonly in the young[so maybe chondorsarcomas can occur in the long bones in later ages]. Except for the greater occurrence of chondrosarcoma in young patients; and comparatively less frequent involvement of upper limb bones, most of the bone sarcoma trends in our population appear to be similar to published western data." In this study there was the odd distribution that showed that osteosarcoma more than chondrosarcoma decreased in occurrence in the old versus the young. Which is odd considering the telomere shortening that occurs with age as chondrogenic differentiation requires longer telomeres than does osteogenic differentiation. "Osteosarcoma derives from primitive bone-forming mesenchymal cells[why we are interested in osteosarcoma; to study mesenchymal stem cell osteogenic differentiation] and is the most common primary bone malignancy. The incidence rates and 95% confidence intervals of osteosarcoma for all races and both sexes are 4.0 (3.5-4.6) for the range 0-14 years and 5.0 (4.6-5.6) for the range 0-19 years per year per million persons. Among childhood cancers, osteosarcoma occurs eighth in general incidence and in the following order: leukemia (30%), brain and other nervous system cancers (22.3%), neuroblastoma (7.3%), Wilms tumor (5.6%), Non-Hodgkin lymphoma (4.5%), rhabdomyosarcoma (3.1%), retinoblastoma (2.8%), osteosarcoma (2.4%), and Ewing sarcoma (1.4%). The incidence rates of childhood and adolescent osteosarcoma with 95% confidence intervals areas follows: Blacks, 6.8/year/million; Hispanics, 6.5/year/million; and Caucasians, 4.6/year/million. Osteosarcoma has a bimodal age distribution, having the first peak during adolescence and the second peak in older adulthood. The first peak is in the 10-14-year-old age group, coinciding with the pubertal growth spurt. This suggests a close relationship between the adolescent growth spurt and osteosarcoma. The second osteosarcoma peak is in adults older than 65 years of age; it is more likely to represent a second malignancy, frequently related to Paget's disease. The incidence of osteosarcoma has always been considered to be higher in males than in females, occurring at a rate of 5.4 per million persons per year in males vs. 4.0 per million in females, with a higher incidence in blacks (6.8 per million persons per year) and Hispanics (6.5 per million), than in whites (4.6 per million). Osteosarcoma commonly occurs in the long bones of the extremities near the metaphyseal growth plates[That's where the Mesenchymal Stem cells are]. The most common sites are the femur (42%, with 75% of tumors in the distal femur), the tibia (19%, with 80% of tumors in the proximal tibia), and the humerus (10%, with 90% of tumors in the proximal humerus). Other likely locations are the skull or jaw (8%) and the pelvis (8%).."
The reason that osteosarcoma coincides with the pubertal growth spurt is due to the increase in cellular proliferation rates. The faster cells are proliferating the more likely you are to be able to detect an abnormality. So an increase in cellular proliferation may not cause the osteosarcoma but rather merely make it more prevalent. Characterization of human multicentric osteosarcoma using newly established cells derived from multicentric osteosarcoma. 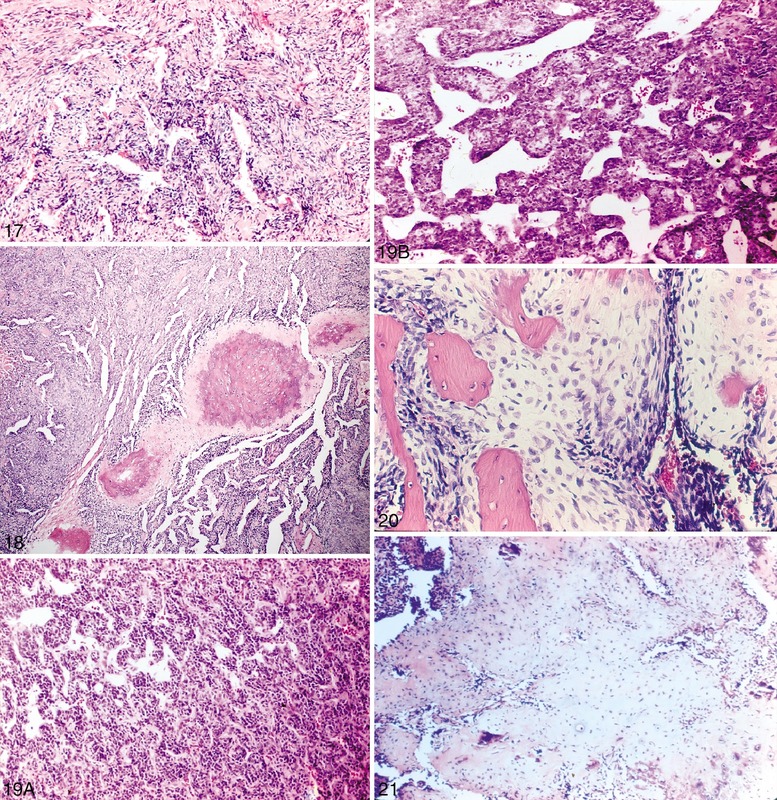 "Human multicentric osteosarcoma (HMOS) is a rare, aggressive variant of osteosarcoma. We used newly established HMOS cells, which were derived from primary (HMOS-A) and secondary (HMOS-P) lesions, respectively, to perform a basic study analyzing the cellular biology and gene expression of HMOS. We performed a cell growth assay, an invasion assay, DNA microarray analysis, quantitative real-time RT-PCR (Qrt-PCR), and a telomerase assay and compared the results between HMOS-A, HMOS-P, and human osteosarcoma (HOS) cell lines (MNNG-HOS and Saos-2). The cell biological analysis revealed that HMOS-A and HMOS-P had similar characteristics to Saos-2, and the invasion assay showed that they had similar characteristics to MNNG-HOS. The DNA microarray study showed that the gene expression profiles of HMOS-A and HMOS-P were similar to that of MNNG-HOS, but the overexpression of MMP-2, MMP-9, and MT1-MMP was observed in HMOS-A and HMOS-P[so these genes are very powerful in changing the spread of bone], which was correlated with the invasiveness of the extracellular matrix[increase mmp-2, mmp-9, and MT1-MMP to increase extracellular matrix invasiveness which can and cannot be a good thing for height growth], and collagen type-4 (COL-4) and VEGF were also detected. HMOS-A and HMOS-P showed low telomerase activity similar to Saos-2, which are known to be telomerase negative, but a similar telomere length and telomerase protein to MNNG-HOS. HMOS-A and HMOS-P demonstrated strong invasive ability, and their gene expression profiles correlated with the invasiveness of the extracellular matrix. Their telomerase activity was low, but they did not shown the typical features of alternative lengthening of telomeres (ALT)." So the telomerase activity correlated with different types of Osteosarcoma and the invasiveness of the extracellular matrix. However, low telomerase activity may mean that they already had sufficiently long telomeres but how would they keep telomere length long with no telomerase and no alternate lengthening of telomeres(the type of telomere lengthening that causes cancer, not astragalus). So shorter telomere length increases the extracellular matrix invasiviness of bone cell types which could mean that shortening of the telomeres in the bone cells along the growth plate can result in fusion(invasion of bone cell matrix against the cartilage). Increasing telomere length of bone cells can slow down fusion. So there doesn't seem to be a correlation between age and chondrosarcoma versus osteosarcoma which is what we would hope for in stating that telomere length correlates with the chondrogenic potential of mesenchymal stem cells. However, cancer usually involves Alternate Lengthening of Telomeres which is a confounding variable in terms of telomere length. We do know that telomere length is extremely important though. Astragalus and Puerarin(via the PI3K pathway) both upregulate telomerase activity. Whether this is sufficient to achieve chondrogenic differentiation is unclear given that there are probably telomere binding proteins involved as well at a cellular level. Relationship between height at diagnosis and bone tumours in young people: a meta-analysis. "Some evidence exists that patients with osteosarcoma and Ewing sarcoma are taller than the general population[Ewing sarcoma and osteosarcoma differ by origin, Ewing sarcoma forms new bone by round cell origin whereas osteosarcoma by mesenchymal origin, neither type implies a chondrogenic intermediary which means that the tumors are not likely to increase height by endochondral ossification]. Relevant studies linking osteosarcoma and Ewing sarcoma with height at diagnosis were identified. 14 studies examined the height of patients with osteosarcoma or Ewing sarcoma. Meta-analyses on SD scores found patients with osteosarcoma were 0.260 SD (95% CI: 0.088-0.432) taller than the reference population (five studies). A meta-analysis on percentages found 62% (95% CI: 57%-67%) of patients were estimated to have a height above the median (six studies). Patients with Ewing sarcoma were 0.096 SD (95% CI 0.004 0.188) taller (four studies). Only one study reported the percentage of Ewing sarcoma patients with height above the median.The average height of patients with osteosarcoma, but not Ewing sarcoma, was significantly above the average height of the reference population by 2-3 centimetres. The observed differences indicate the involvement of pubertal longitudinal bone growth in osteosarcoma development while different biological pathways could be relevant for Ewing sarcoma." Do the biological processes in osteosarcoma make you taller? Or are there common causes between height gain and osteosarcoma? Since Ewing sarcoma and Osteosarcoma have the same effect which is an increase in bone formation but have different origins mesenchymal versus round cell, it is likely that the changes in properties of the mesenchymal cell are causing the increase in height rather than the increase in bone formation. "In dogs, where osteosarcoma is 40 to 50 times more common than in humans , an increasing risk of osteosarcoma has been seen with increasing weight and increasing height of the dog which persists even after adjusting for breed size"<-so increase in height may cause the osteosarcoma. Since there are more cell divisions the taller you are the more likely for an abnormality to occur causing osteosarcoma. If the height increase displayed by children with osteosarcoma is caused by changes in the properties of mesenchymal stem cells then it would be worthwhile to analyze the properties of MSCs in individuals with osteosarcoma to see if any of these can be applied to healthy individuals to increase height. "An interesting link seems to exist between growth, particularly in adolescence, and both osteosarcoma and Ewing sarcoma. A particular bone tumour of a given cell type usually arose in a field where the homologous cells were most active and so osteosarcoma arose in the metaphysis which had abundant osteoclasts whereas round cell tumours (Ewing sarcoma) develop in the bone-free marrow cavity of the mid-shaft (diaphysis). Further studies on human and canine osteosarcoma suggested a link between growth and occurrence of these tumours. Price observed that there was an overall preponderance of osteosarcoma in males, with the mean age of occurrence later than in females. There was also a predilection of osteosarcoma for long bones of the lower limb with the mean age of occurrence later than osteosarcoma in the upper arm. "<-Osteosarcoma develops in the bone whereas ewing sarcoma develops in the bone marrow thus osteosarcoma has more ability to increase height. More osteoclasts indicate increased likelihood of Osteosarcoma. It could just be that more cells equals a greater chance for a cellular process to go wrong. The study also suggests that osteosarcoma could be linked to height growth than Ewing Sarcoma due to the fact that osteosarcoma is more likely to occur in the lower limbs than ewing sarcoma which incidence is distributed more evenly. Lower limb growth is more associated with height. This does not rule out the possibility that the pathology of Osteosarcoma can in some way contribute to height growth and some of the properties of Osteosarcoma can be used to safely induce adult height growth. Mesenchymal chondrosarcoma: clinicopathologic study of 20 cases. Mesenchymal chondrosarcomas managed to grow within the bone. The problem is that they began to invade the soft tissues outside the bone. Figure 20 is kind of what we're looking to induce with LSJL with chondrogenesis surrounding the bony trabaculae(pink region). It doesn't look like endochondral ossification is being induced however. 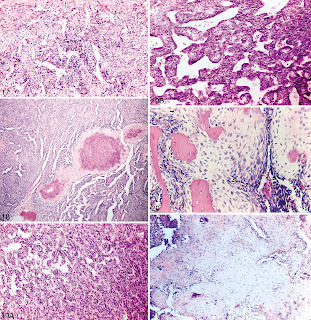 "The histology of mesenchymal chondrosarcoma is typically characterized by a unique, biphasic pattern, composed of mesenchymal and chondrocytic components.The background of undifferentiated mesenchymal, small, round or spindled cells is interrupted by highly differentiated islands of hyaline cartilage. The primitive, round cell component often contains a hemangiopericytomatous vascular pattern, and the cartilage component may include sites of osteoid production, ossification, or calcification"
c-MYC overexpression with loss of Ink4a/Arf transforms bone marrow stromal cells into osteosarcoma accompanied by loss of adipogenesis. "we established a mouse osteosarcoma (OS) model through overexpression of c-MYC in bone marrow stromal cells (BMSCs) derived from Ink4a/Arf (-/-) mice. Single-cell cloning revealed that c-MYC-expressing BMSCs are composed of two distinctly different clones: highly tumorigenic cells, similar to bipotent-committed osteochondral progenitor cells, and low-tumorigenic tripotent cells, similar to mesenchymal stem cells (MSCs). It is noteworthy that both bipotent and tripotent cells were capable of generating histologically similar, lethal OS, suggesting that both committed progenitor cells and MSCs can become OS cells of origin. Shifting mesenchymal differentiation by depleting PPARγ in tripotent MSC-like cells and overexpressing PPARγ in bipotent cells affected cell proliferation and tumorigenic activity. Differentiation potential has a key role in OS tumorigenic activity, and that the suppression of adipogenic ability is a critical factor for the development of OS." "both WT and Ink4aKO BMSCs were positive for CD44, Sca-1 and Thy-1 (CD90.2), and were negative for CD45, CD31 and c-Kit. Under optimal differentiation conditions, both types of BMSCs were able to undergo adipogenesis, osteogenesis or chondrogenesis"
"The nuclei of the tumor cells located in these mature bone and cartilage formations were strongly positive for Runx2 and Sox9 immunoreactivity, respectively. In contrast, nuclei from immature parts of the tumor were negative for these genes. Moreover, immature tumor cells were enriched at the interface between normal tissue and OS, whereas osteogenesis and chondrogenesis were apparent mainly in the non-interfacial regions of the tumor"
Can any one tell me if my growth has stopped? Now, what i want to know is just one answer (with reference or example to get me satisfied ) Is my growth plates closed or not? this is my hip bone x-ray. So, please let me know if they are still open or closed. Osteoclasts don't seem to absorb bone lengthwise in distraction osteogenesis. Osteoclasts and Osteoblasts seem to absorb based on the OPG/RANKL gradient. Which is usually width wise. I would like to see some evidence of your osteoclasts absorbing bone lengthwise. tyler instead of just astragalus i heard a common food plant called purslane has stronger telomere lengthening effect, go to imminst forum and under the supplement section they have a immense astragalus/telomere thread there is also a 3rd party product called astral fruit if your a member it becomes much cheaper.. anyways i would like to let you know.. also read up on the "stem cell theory of aging"-you should read up what life extensionst say because they focuse on dna repair, telomeres (obviously) and stem cells..
in fact i hope you do research on these three areas..and possibly add in the low vibration pulsed ultrasound or lsjl..
lol im always searching for supplements to increase stem cells.. but im still learning about the field..